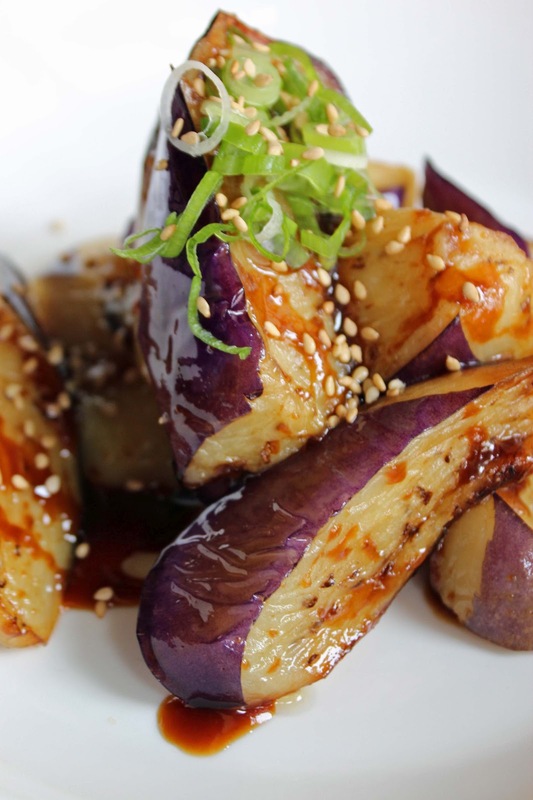 When HinoMaru first opened, Chef Koji Miyamoto had told me that the menu would be gradually expanding, offering a few specials and introducing new dishes as the restaurant slowly eases into a rhythm. To say I was surprised at how much this little noodle shop that could has grown in just a few months is quite an understatement. 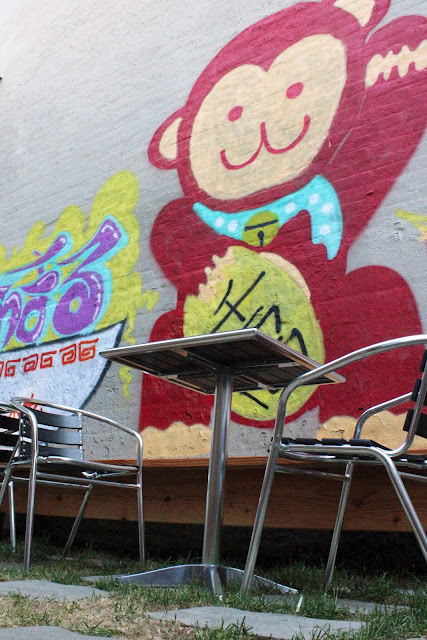 The menu now includes all of the original regional soups and dishes, along with the addition of a chalkboard of daily specials, as well as a whole second printed page of nearly twenty Japanese tapas-style plates and seasonal noodle and rice bowl additions -- almost all under $10. These softshell crab niku man (steamed buns) with scallions, cucumber straws, and sriracha mayo were some of the most delicious bao buns I have enjoyed. 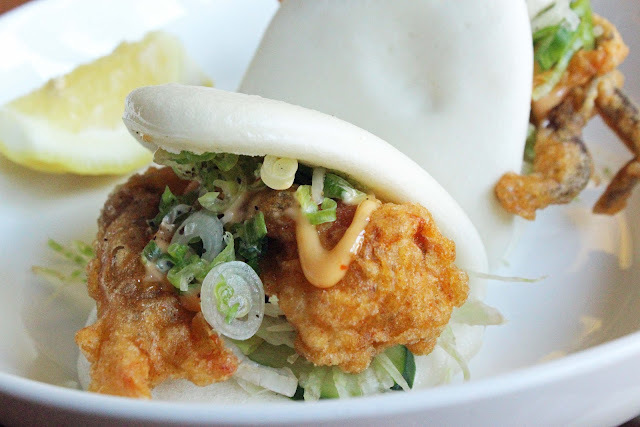 The crunch of the breaded shellfish tucked into that heavenly soft (see how even the slightest fingerprint dimples the bread in the top bun?) Pac Man-shaped rice flour bread was simply fantastic. 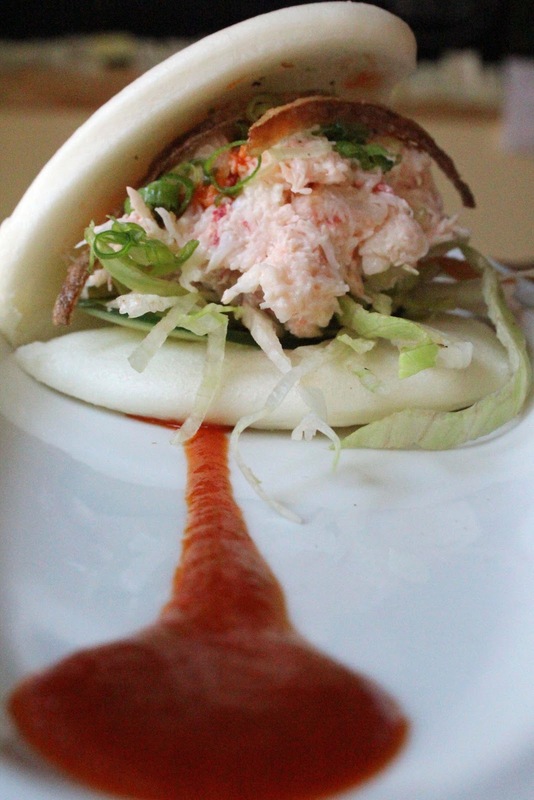 The steamed nikuman are also available stuffed with spicy crab, tender pork belly, and even tempura shrimp. 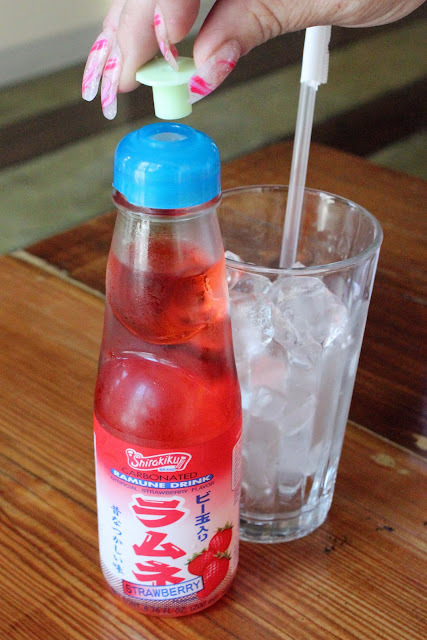 And how much fun is this summertime strawberry ramune drink? See how the bottle is "pinched" creating a figure 8 shape? A glass marble is secured at the mouth by the pressure of the carbonation. A little pushcap is served with the bottle, which you press into the marble until it pops down, and rattles around the upper drink chamber as you pour the soda. Neighboring tables watched in amusement while we clumsily struggled to open this children's soft drink, but the refreshing result was worth it. 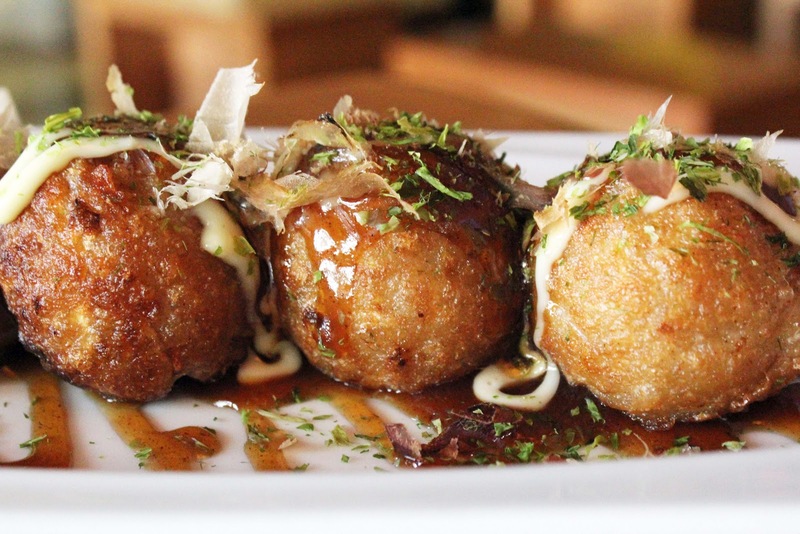 As if the variety of regional staples on the regular ramen menu aren't enough, the specials are wildly varied and interesting. One of my favorites is this uni ramen, the noodles tossed in a very light parmesan cream, with a generous heap of sea urchin on top, along with fish cakes and nori shreds. Like a seafood carbonara, it is undoubtedly one of the most original ramen dishes I have enjoyed, and wonderfully delicious. 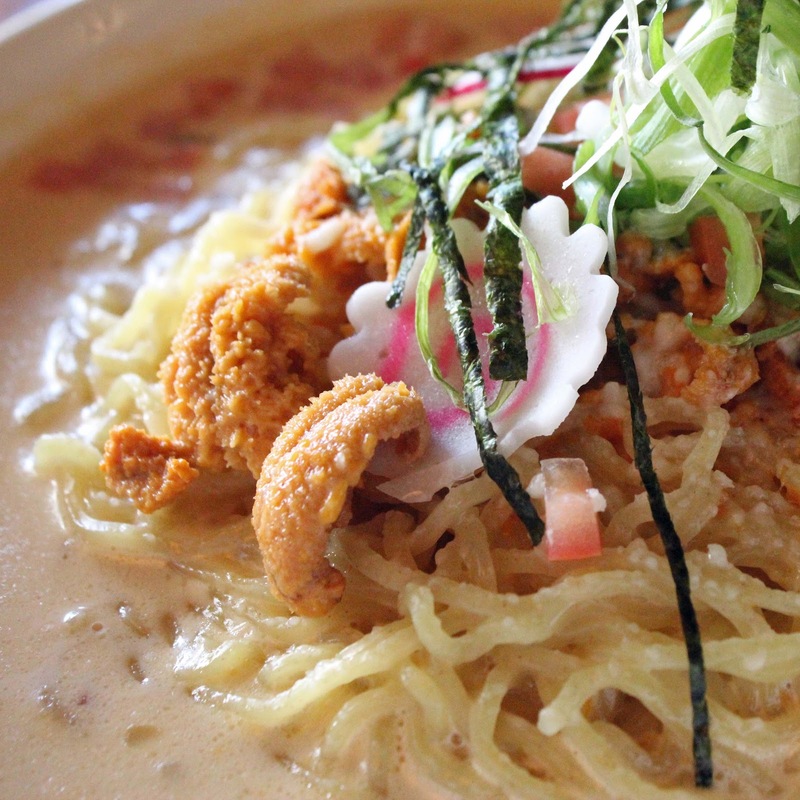 Because piping hot ramen doesn't exactly strike a temptation in the stuffy New York City August heat, this cold seafood ramen is a refreshing departure from traditional noodle dishes. 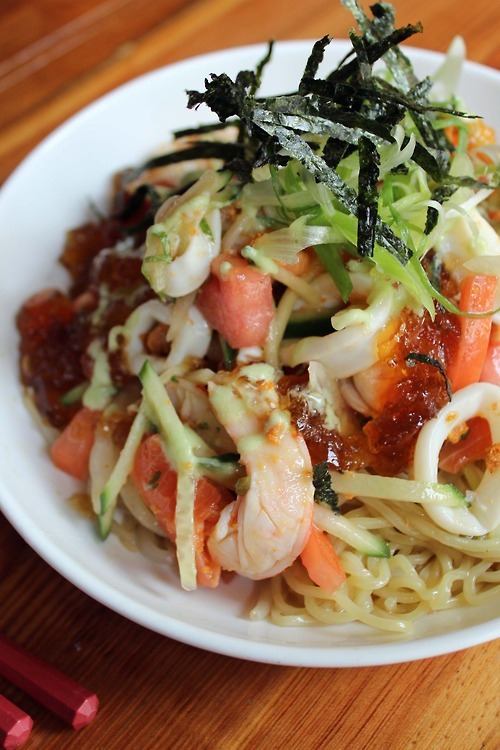 Served chilled, a haystack of noodles is loaded with butterflied sweet shrimp, calamari rings, slivers of salmon sashimi, sea urchin, and shimmering dollops of a yuzu-soy-seafood jelly. 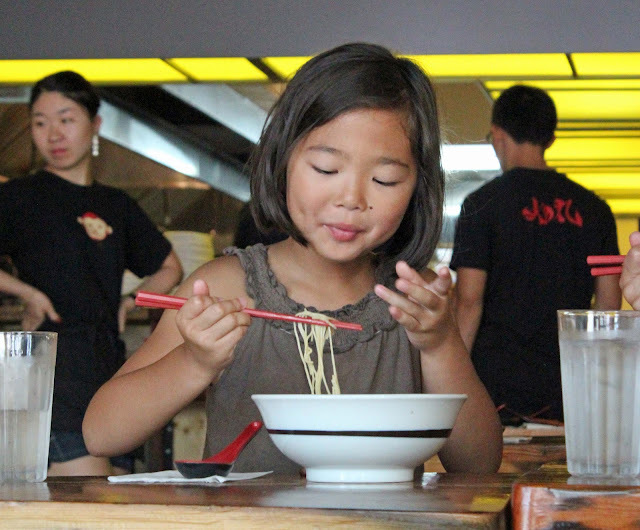 As you mix the jelly into the noodles, it melts, creating a delicate and playfully flavorsome glaze of Asian citrus and seafood, making this a very special dish. 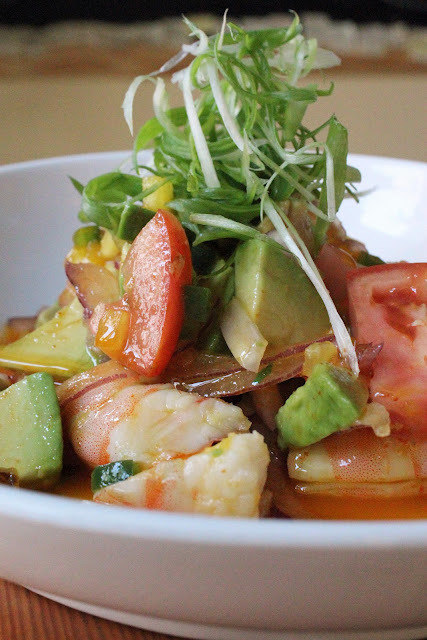 A spicy jalapeno citrus base lays the flavor foundation for a unique shrimp ceviche, greenified with creamy avocado slivers and large chunks of red tomato and onions, sweetened with tangy cubes of fresh mango. 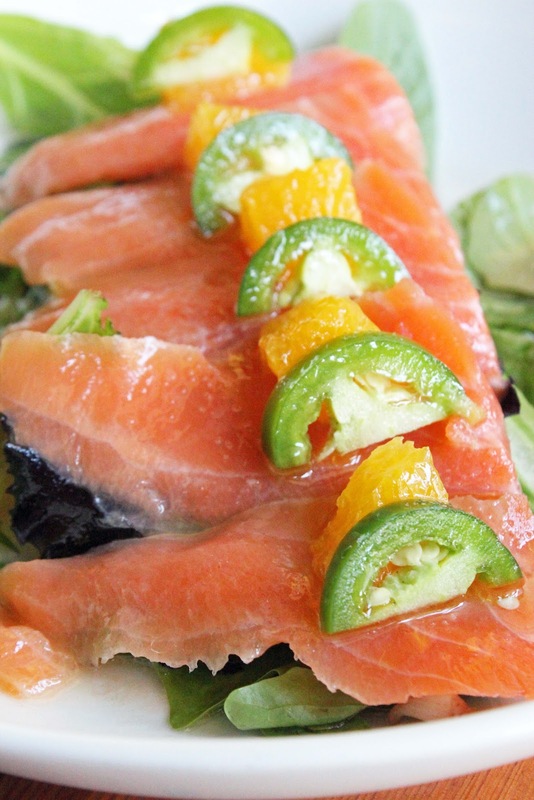 Jalapeno and mandarin orange studded salmon sashimi arrives on a bed of field greens. 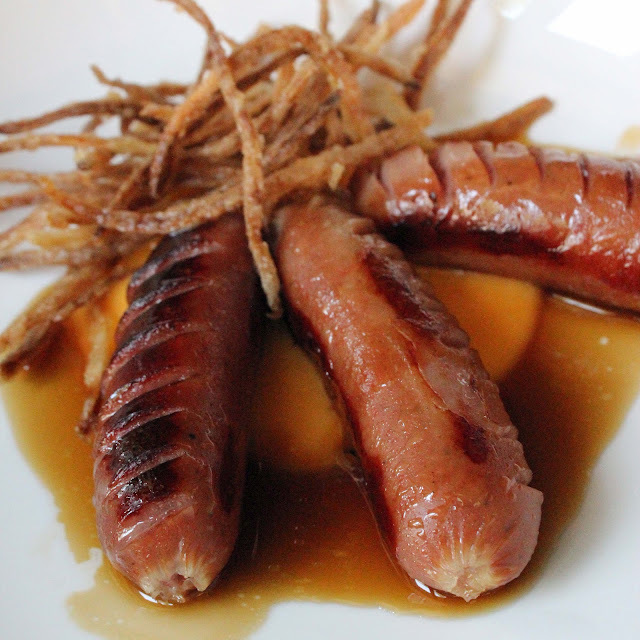 The menu also includes some less traditional and surprising dishes, like these browned, scored links of kurobuta sausage. These bershire pork links are served on a bed of satsuma potato puree, a golden sweet potato whose rich color symbolizes wealth. Vegetable small plates range from a cubed watermelon-tomato salad with yuzu vinaigrette, to sautéed cauliflower, seaweed salad with sweet corn, and this tender bowl of miso nasu--eggplant drizzled with a sweet miso glaze. 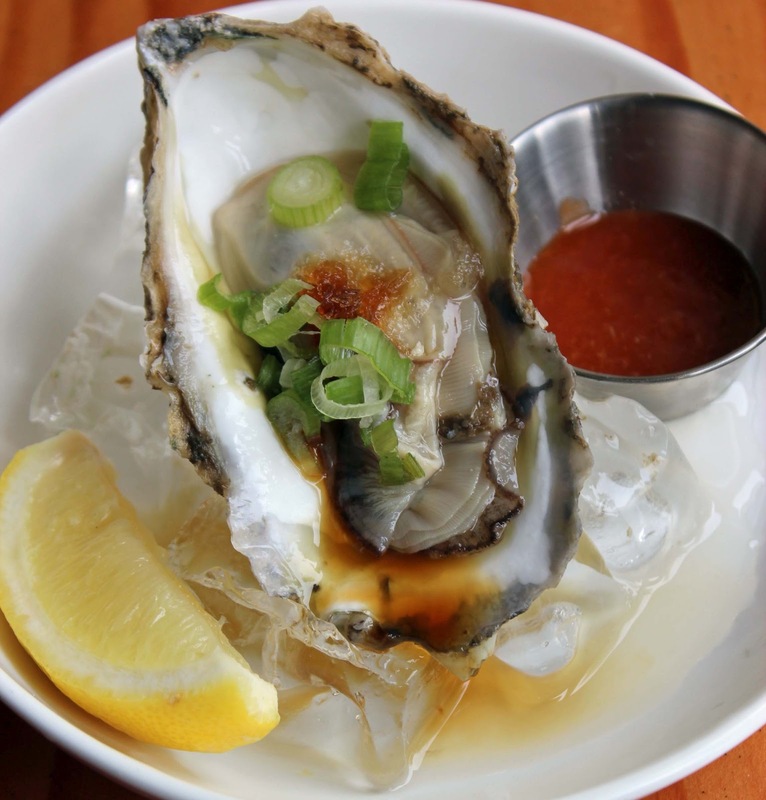 The menu now even boasts east and west coast oysters, though when we visited they only had Long Island oysters available--which were extremely fresh. 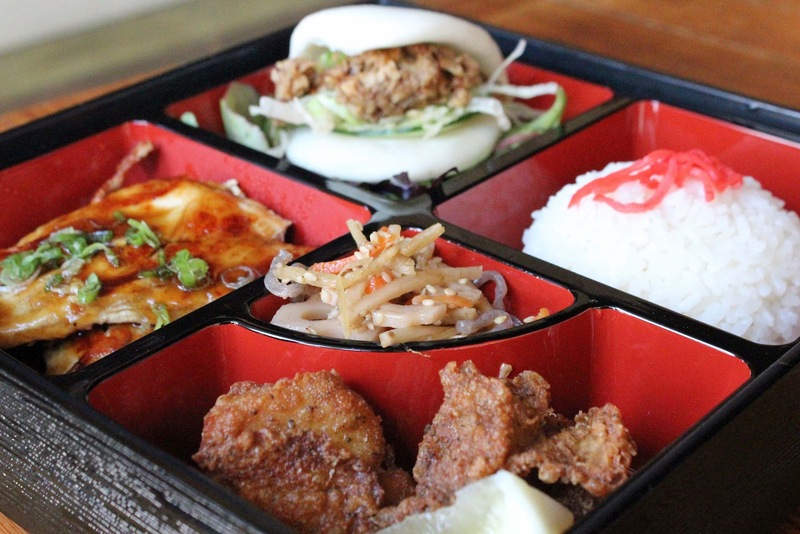 Alongside daily ramen and small plate specials, fantastic lunch deals rotate throughout the week, sometimes including a beautiful bento box like this with juicy chicken terriyaki, crunchy coated Japanese fried chicken, and a steamed pork nikuman. 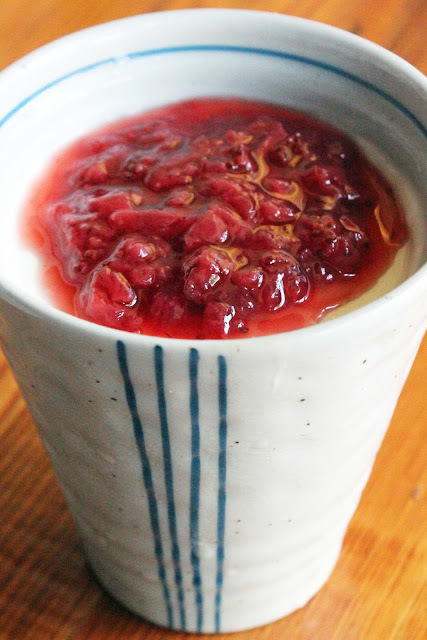 Expected sweet endings include chewy, frosty orbs of various flavored mochi, but a delicious surprise includes this wonderfully silky coconut panna cotta, topped either with strawberries or diced mango, like a heavenly creme parfait. The service is impeccable. The prices are extremely affordable. The space is pristine, and surprisingly spacious with several communal tables in a large back room, and a sweet graffiti garden patio in back. Considering so many Americans seem to equate Japanese cuisine exclusively with sushi or chicken and vegetables flying across a flaming table, HinoMaru is an exceptional introduction to just some of the lesser known culinary delights of this fascinating country's kitchens and street food carts. I have not been on your blog in a while but glad to see there's lot of catching up for me! I have not been on your blog in a while but glad to see there's lots of catching up for me! This place looks awesome!!! I should venture into Astoria, i thought it was somewhere else.... nice!! !